Today's Health Activist's Writer's Month Challenge is to write about an inspirational quote. I immediately hit Pinterest. If you click the picture above, you will see that I have a board of words that inspire me. This is a quote that I recently found that inspires me. When I googled the quote to find the author, I could find no attribution, just that it is an anonymous quote. I used to have a really bad habit. When things were crazy in my life or seemed out of control, as a way of getting through it, I would fixate on the next "good" event. I would count it down and anxiously await it. That would help me get through whatever moment of craziness I was experiencing. And I had some pretty severe moments of craziness. My health focus is Type 1 Diabetes. But early in my marriage, I had undiagnosed Poly-Cystic Ovarian Disease and Bi-Polar and on top of that my husband worked out of town. He was only able to come home 1 weekend every other month during the winter months. I had 3 children. The oldest was 7 and Seth and Leah were babies, just 17 months apart. 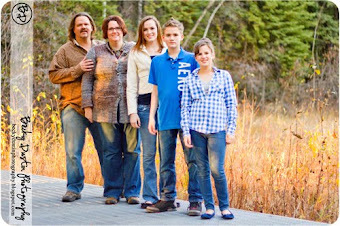 The babies were actually born during this time after several years of infertility. I was living day to day and it was not pretty at my house. Eventually I found an incredible doctor who listened to me and got me the help I needed. I look back on that time now and realize that all of the moments that I fixated on to help get me through were good, but I don't have a great recollection of my babies and the significant moments in their lives. They happened. I was there and it was all documented (thank heavens for scrapbooks), but I was so focused on the other things to help me cope, that I don't have a lot of memories of them. When I found this quote, it tugged at my heart. This was my life, I was in the middle of a storm and I was just WAITING for it to pass. Waiting and missing out on all the magical moments. Earlier this month, we took a long awaited and much planned trip to Walt Disney World. I had dreamed of doing this since I was a little girl. I could not wait to see Cinderella's Castle! The morning arrived that we were to go to the Magic Kingdom and the girls and I got up and got ready, but when we opened the hotel room door we were met with ginormous raindrops. The girls and I chose not to be discouraged. We headed to the Magic Kingdom, viewed the castle through raindrops and bought Mickey ponchos. I got to experience the pure joy of watching my girls skip through puddles and dance in the rain, it is a moment I will never forget. I think my quote pretty much epitomizes that. 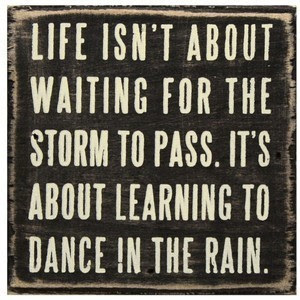 We are not waiting for the storm of T1D to pass, we are dancing in the rain! Then dance every dance. I love you guys!